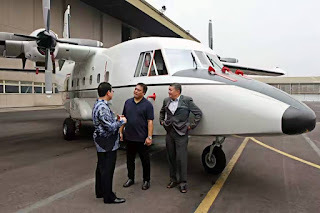 MANILA, -- State-owned aircraft manufacturer PT Dirgantara Indonesia (DI) says it has completed the manufacturing of two NC212i aircraft ordered by the Philippines. Equipped with ramp doors and a modern navigation and communication system, the multipurpose plane, which is the latest generation of NC212 and has a carrying capacity of 28 passengers, is the first Indonesian aircraft ordered by the Philippines. The Philippines has not upgraded its air force’s fleet its aircraft in the last 20 years. PT DI commerce and restructuring director Budiman Saleh said the purchasing contract of the two NC212i aircraft, including their spare parts, was worth US$19 million. “We can do it in affordable prices, and with no dependency to the US. You can also put Israeli technology inside,” Budiman said. He accompanied Raymundo de Vera Elefante, Undersecretary for Finance, Ammunitions, Installations and Materials of the Department of National Defense, and Philippine Air Force Chief of Air Staff Maj.Gen. Rozzano D Briguez during a visit to the company’s fixed wing airplane hangar in Bandung on Friday. Budiman further said the delivery of the aircraft would be conducted after Philippine pilots received training about the instruments and technical conditions at PT DI. “We will take it on time. Hopefully, it will arrive in the Philippines in the first semester [of next year]. Our pilots will receive training this December,” said Elefante. According to PT DI, the NC212i aircraft can be used for producing artificial rain, maritime patrol and coast guard patrol. More than 600 units of its previous generation C212 series have been used by 38 countries, including Chile, Mexico, South Africa, Spain, Thailand, the Philippines and the United Arab Emirates. Philippine Air Force Chief of Air Staff Maj.Gen. Rozzano D Briguez (right) and Raymundo de Vera Elefante (center), Undersecretary for Finance, Ammunitions, Installations and Materials of the Department of National Defense, listen to state-owned aircraft manufacturer PT Dirgantara Indonesia (DI) commerce and restructuring director Budiman Saleh (left) in a visit in Bandung on Nov.4.